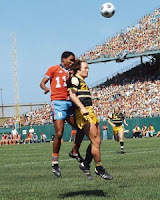 The Minnesota Kicks once beat the Cosmos 9-2 in a playoff game, in one of the North American Soccer League's more bizarre results. But that's not the only reason why I think they embodied the League's spirit of rock n roll soccer more than their New York rivals. There was the spontaneous, organic nature of the Kicks' rapid rise from nothing to crowds of 46,000 within weeks of playing their first ever game. There was the free-scoring, attacking nature of their play. And there were the proto-Rave tailgates where - outside the Kicks' stadium before the game - thousands of young people enjoyed the summer weather, the drink, the drugs, and each other. Read more here in my piece at The History Reader, a spin-off site run by the US publisher of Rock n Roll Soccer, St. Martin's Press.